Education plays an important role in our “Quality Matters” policy. The more you know the more you can create! 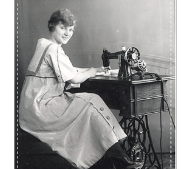 With your sewing machine have fun learning and increasing your skills with our Quilting classes. Please let us know what you want in the way of classes. We are always looking for new ideas and ways to increase your sewing skills. Please check calendar for current dates, time & fees. This class covers free-motion quilting/stitching concepts and techniques: sewing machine set-up; needle, thread and foot selection; stippling; meandering; stitching specific motifs/patterns. Expand and practice your free-motion stitching skills with a variety of motifs that will take you beyond the basics. Explore design ideas for the “quilt as desired” instruction. Students will prepare, practice, and stitch motifs from different design categories (e.g. floral, geometric, feather, and animal) on a quilt sandwich of their choice. Other topics include resizing and combining motifs, marking and managing your quilt top, and selecting threads. Prerequisites: Students must have basic free-motion stitching skills. Learn basic machine quilting skills while making a pair of quilted oven mitts. These mitts make great gifts (think Mother’s Day- Father’s Day) as well as a fun and easy way to freshen your kitchen. Basic sewing skills required, but no quilting experience needed.